On Friday, Google’s Motorola Mobility filed a new lawsuit against Apple with the U.S. International Trade Commission (ITC) in Washington, seeking to ban the imports of virtually every Apple product into the U.S. At the time, the details of the filing weren’t public yet, but the ITC has now posted the full complaint online and we can finally get a better idea of the patents Apple allegedly violated. According to the complaint (embedded below), Motorola argues that Apple infringed upon seven Motorola patents: 5,883,580, 5,922,047, 6,425,002, 6,983,370, 6,493,673, 7,007,064 and 7,383,983. As expected, the lawsuit targets Apple’s iPod Touch, the iPhone 3GS, 4 and 4S, the iPad 2 and the “new” iPad, as well as the Mac Pro, iMac, Mac mini, MacBook Pro and MacBook Air and all other Apple devices “which utilize wireless communication technologies to manage various messages and content.” In the complaint, Motorola also argues that Apple was fully aware of a number of these patents. Motorola is requesting a target date of no more than 15 months from now, so we will likely hear quite a bit more about the proceedings in the coming year. 5,883,580: “The ‘580 Patent generally relates to messaging devices that process messages logically for a user in the context of space and time.” From the abstract: “This invention relates in general to selective call messaging devices and more specifically to messaging devices that process messages logically for a user in the context of space and time .” The target here seems to be Apple’s location reminders and Motorola specifically argues that the iPhone 4 and 4S infringe upon this patent. 5,922,047: “The ‘047 Patent generally relates to communications and control systems for multimedia.” From the abstract: “In the preferred embodiment the multimedia control apparatus provides for control over a plurality of media applications including telephony, video conferencing, analog video, digital video, and AC power line signaling (for control over premise or subscriber equipment such as HVAC lighting security and entertainment).” Every iPhone and iPad currently in the market infringes upon this patent according to Motorola. 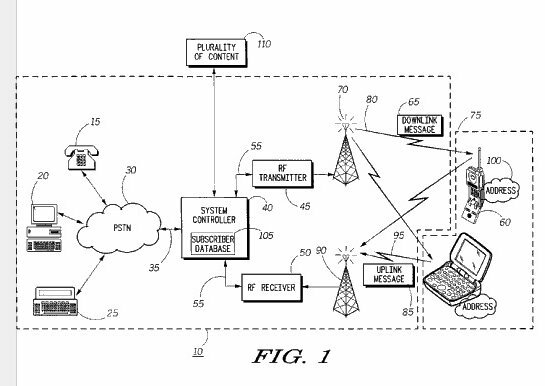 6,983,370: “The ‘370 Patent generally relates to communication systems incorporating capabilities to provide continuity between messaging clients. More specifically, the ‘370 Patent relates to the ability to sync the messaging capabilities of multiple devices.” Unsurprisingly, given that this patent is about syncing, Motorola alleges that every Apple device in the market right now, with the exception of the iPod line and Apple TV, infringes upon this patent.